Thanks to support from several commenters (and a little challenge from Lisa! ), I’m working on the Christmas Cactus quilt. 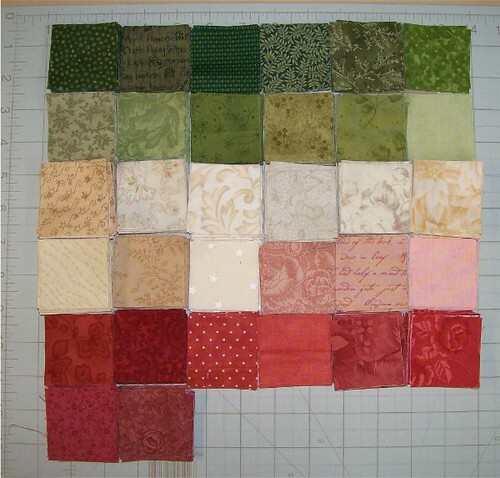 I made a lot of progress today – all of the squares are cut out, and strips are cut for the half square triangles. I am so glad you are doing it. I actually have thought about giving it a try myself as it is sooooo gorgeous. I know you will have yours done long before I do. Yeah!!!! Go Sandi, Go Sandi……….Rah Rah Rah! I love the color combination-very Christmassy. Wow, I have about 300 squares to cut out for a project and I thought that was a lot. It will be so beautiful and wonderful once it is finished. Good for you! It is going to be a fantastic quilt! Cant wait to see the finished quilt! The fabrics you chose appear to fit the pattern amazingly! Enjoy the process! Gorgeous colors! Can’t wait to see more…! Hee hee, why do we do this to ourselves.